New codings for the ICT Access and Use Research Project's fourth phase. Written for researchers interested in the ICT Access and Use Project's coding indices' development. 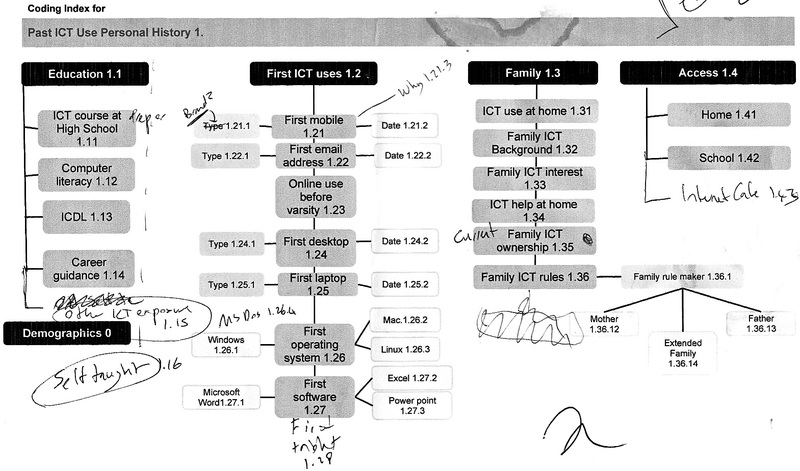 Nodes were added for "Other ICT exposure 1.15" and "Self-taught 1.16" as not every student received formal schooling in ICT: for an example of 1.15; A Fort Hare university student had never had professional or formal classes in computing. For 1.16, the only training a Rhodes University student had was teaching himself; he fixed his family's computers himself. And a University of the Free State student "used to touch the home computer" to teach herself. I thought it was a bit old school for freshers in 2011, but was suprised when MS Dos was mentioned as a first operating system! So, the node "MS Dos 1.26.4" was added. One student accessed computers outside school and home at secondary school (hence "Internet cafe 1.43"), two students volunteered information on why they got mobile phones ("Why get a mobile phone 1.21.3"), another spoke about one's first computer tablet ("First tablet 1.28"). The largest index saw the most revisions. 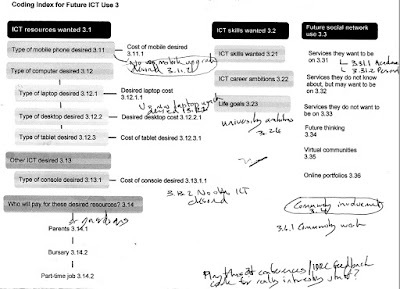 Given the research project's interest in the use of mobile phones, the most important change was adding nodes that would allow the research team to track the most common platforms used to access online services and apps ("Platforms used in access 2.26" included "Computer 2.26.1", "Laptop 2.26.1.1", "Desktop 2.26.1.2", "Mobile 2.26.2" and "Tablet 2.26.3"). I also added the online services ("Webmail 2.21.13", "Music downloads 2.21.14", "Whatsapp 2.21.15", "Online forums 2.21.16", "YouTube 2.21.17", "Snap2 2.21.18", "Shazaam 2.21.19", "Online radio stream 2.21.20") and mobile phone apps ("Cognician 2.22.10" and "ToGo 2.22.11")recently mentioned by students. I also added the node "Does not use apps on mobile 2.22.9" to cover those students who explicitly stated that they did not download and/or use mobile apps. Given the prevalence of iPods, I had to add "Music players 2.15.4" under the category "Other ICT owned"! 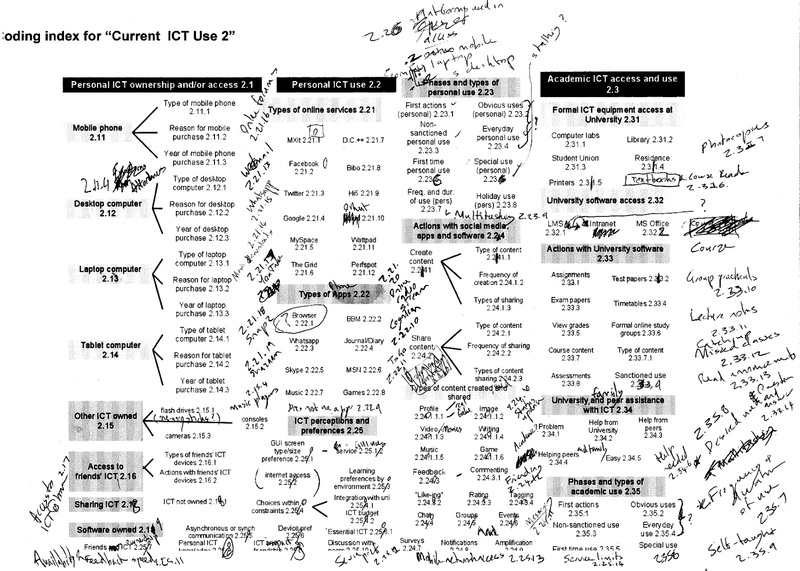 Some students mentioned that they had "Access to ICT at home 2.17", while "Multitasking 2.23.9" was added as a theme that kept cropping up in students' use, for example of social media in the background as they worked on assignments. The line between the use of social media for social and academic use is becoming blurred, as students report using social networking tools for both formal and informal academic work. This seems largely to be due to social media's affordances for ease of communication, efficient creation of academic groups and even saving money on MXit. This was reflected in student interviews and nodes for "Status update 2.24.10", "Messaging 2.24.11" and "Friending 2.24.12" were added, which could be applied to tracking affordances typical of social media. Some first-year students also volunteered a fair amount of information on their preferences for response times ("Availability and feedback speed 2.25.11"), what they preferred to access services on ("Service preference 2.25.12"), how they felt about losing network access ("Mobile network access 2.25.13") and whether they experienced any limitations from their cellular provider ("Service limits 2.25.14"). Several students described having problems when using photocopying equipment for the first time ("Photocopies 2.31.7") and the importance of formal provision of either analogue and/or digital course material ("Textbooks and course reader 2.31.6"). Interviews revealed a wider range of actions with university software than initially identified, so the following nodes were added: "Group practicals 2.33.10", "Lecture notes 2.33.11", "Catch up missed classes 2.33.12", "Read announcements 2.33.13" and "Question and answer 2.33.14". And the following nodes were added under phases and types of academic use; "Frequency and duration of use 2.35.7", "Desired use 2.35.8" and "Self taught 2.35.9". Due to having recently upgraded mobile, laptop or other ICT technology and/or experiencing financial constraints, some students indicated that they did not want an upgrade ("No new mobile phone upgrade desired 3.11.2", "No new laptop upgrade desired 3.12.2" and "No other ICT desired 3.13.2"). Some students spoke about their ambitions at university ("University ambitions 3.24"), as well as the services they wanted to be on ("Academic services 3.31.1" and "Personal services 3.31.2"). Another University of Cape Town student mentioned his community involvement and promotion of ICT, so the node "Community involvement 3.4" was added to reflect this. Lastly, a node "Play at Conferences 4" has been added to track the most interesting segments of student interviews. These are intended to be exported and formatted for playing at conferences by the project's research lead, Laura Czerniewicz, or principal investigator, Cheryl Brown.